The Nigeria Football Federation have announced an attack-heavy roster for the Olympic Eagles U23 Africa Cup of Nations qualifying match against Libya. An analysis of the roster revealed that ten attack-minded players were included in the squad list by head coach Imama Amapakabo, with Liverpool loanee Taiwo Awoniyi, Arsenal loanee Kelechi Nwakali and Spezia's David Okereke among the eye-catching names. Villarreal's Samuel Chukwueze, Club Brugge youngster Dennis Bonaventure, ex-Manchester United winger Tosin Kehinde and Montreal Impact right winger Okonkwo are part of the 23-man group. The squad contains three goalkeepers, eight defenders and six players each classed as midfielders and strikers by the Nigerian Federation front office staff. 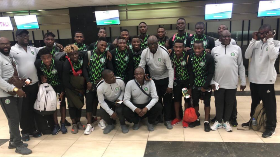 The Dream Team VII have left for Bergandan for the first leg U23 AFCON qualifier versus Libya U23 which will hold in Tunisia on Wednesday 20th March, 2019.